This story was updated March 26. That other cheating investigation, dubbed Operation Varsity Blues, ensnared 50 defendants and also involved UCLA. It has drawn international attention, with celebrities, wealthy business people, coaches and college administrators among those charged this week. Like that scandal, the Chinese cheating charges also raise issues of fairness. "It undermines the credibility of the admissions process for the university," Ryan said. "It's also potentially taking away spots from other people who are submitting valid scores." Strong TOEFL (Test of English as a Foreign Language) scores are critical for international students because many schools use them to assess the English proficiency of non-native speakers. Student visas are granted only after acceptance by a school. 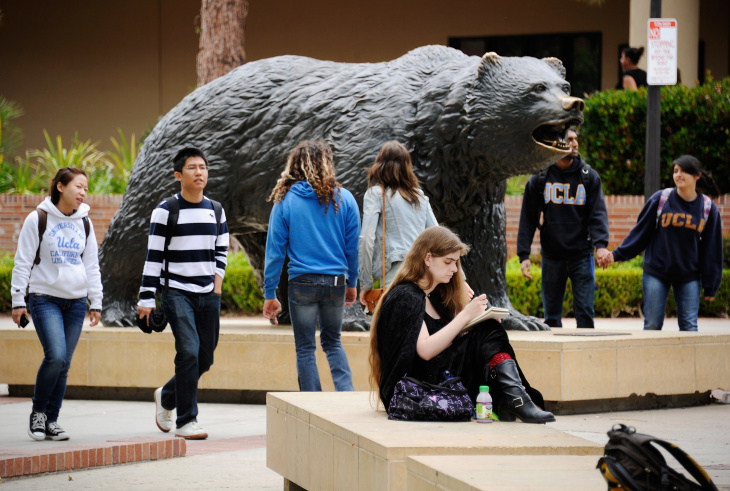 Of the five defendants with ties to UCLA, four have already graduated and had been members of a Chinese student association on campus. They include alleged ringleader, 23-year-old Liu Cai of Woodland Hills; Quang Cao, 24, of San Francisco; Elric Zhang, 24, of Los Angeles and Tuan Tran, 33. Ryan said that Mohan Zhang, 24, of Cerritos is the only defendant currently studying at UCLA. He said a sixth defendant, Samantha Wang, attends Cal State Fullerton. A spokeswoman for Cal State Fullerton said the university had not been able to confirm Wang is an enrolled student. All the defendants are U.S. citizens except for Cai and Mohan Zhang, who are Chinese citizens. The defendants, except for Tran who was in Taiwan at the time, were taken into custody on March 12 and released on bail after pleading not guilty to charges of conspiring to use false passports, using false passports and aggravated identity theft. Ryan said Tran has since returned to the United States and made his initial appearance March 22 and was also released on bail. Ryan said more defendants could still be named. UCLA did not respond to requests for comment. UCLA said earlier this week that its prominent men's soccer coach, Jorge Salcedo, had been put on leave, after he was charged with racketeering in the Operation Varsity Blues investigation. Ryan said 39 Chinese clients have been linked to the cheating scheme, and at the time, were either in high school or community college. Those clients were trying to gain entry to a variety of U.S. four-year colleges and universities. No action has been taken against any of the students. Ryan said some have since returned to China. Federal authorities may contact the schools of the remaining students at some later date. The cheating scandal comes after a string of arrests in similar test-taking fraud cases around the country including in Philadelphia and Boston. Ryan said federal authorities in Boston had passed along the tip that broke open the Los Angeles case. They had learned that a credit card belonging to the lead defendant, Cai, was used to pay for 39 Toefl exams. Some students who've come from China say that cheating is a rampant problem among some wealthy international students. Pasadena City College student Chloe Han said she knows from personal experience. Han, who hails from Nanjing, said she was offered money by someone online last year to do schoolwork for other Chinese students after she bragged about getting A's on her Japanese and anthropology exams on WeChat, the Chinese-language messaging app. "They just ask me do you want to write essay for other people?" Han said, laughing in disbelief. "And I was like, no, I don't want to be caught." The alleged scheme in Los Angeles is not new to the area. Ryan said he prosecuted a case last year of a Chinese woman named Li Bai who was registered to take eight English exams for other people in greater L.A. over the span of a week. Investigators first identified her after she took the same test in Mexico City. "We actually had information in that case that she was taking tests all around the world," Ryan said. Bai was deported back to China. 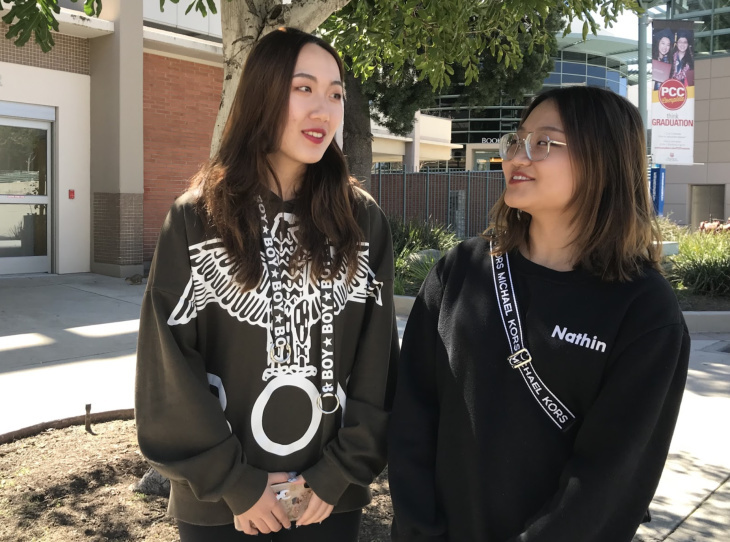 Over at PCC, Han and her friend Sheron Zhang, both 19, condemned fellow Chinese students for cheating, saying it perpetuates stereotypes that they're lazy troublemakers. "Shame on them," Zhang said. "I look down on them," Han added. Han said she works hard to improve her English, forcing herself to speak up at least twice each class. Her goal is to get good enough marks at PCC so she can transfer to her dream school: UCLA. March 26, 4:45 p.m.: This article was updated with information on the defendant Tuan Tran. March 15, 5:10 p.m.: This article was updated with comment from Cal State Fullerton and to clarify that the clients of the alleged scheme were trying to get into a range of schools.